Film fans (true film fans) have a list of filmmakers which they admire. This admiration can stem from many different places. You can appreciate someone for the way that their films are shot, the creativity in their stories, or the distinct "voice" which they bring to their projects. I admire New York-based filmmaker Frank Henenlotter because he sticks to his guns and makes the movies which he wants to make. His films certainly aren't for everyone, but when you watch them, you just know that (as much as the budget allows) Henenlotter's vision is there on the screen. His 1990 entry Basket Case 2 is the perfect example of this. Basket Case 2 opens just moments after the finale of Basket Case. That film saw Duane Bradley (Kevin Van Hentenryck) come to New York City with a large wicker basket which contained his brother, Belial. The two had been born conjoined twins, but had been separated when they were teens, as Belial never fully formed. Instead, he became a twisted, homicidal mass who shares a psychic link with Duane. As the first film concluded, Duane and Belial had both fallen from a hotel window (and were presumed dead until this sequel appeared). Duane awakens in the hospital and promptly escapes with Belial. The two are rescued by Granny Ruth (Annie Ross) and her daughter, Susan (Heather Rattray), who run a home for "freaks". Duane and Belial move in and are welcomed into this strange house, where both find soulmates. Meanwhile, an intrepid reporter (Kathryn Meisle) is determined to find the brothers. Will they ever find peace? If you've seen any Frank Henenlotter movie, then you know that they are weird. Even given those parameters, Basket Case 2 is really weird. Especially when its compared to the first film. Basket Case was an odd, but straight-ahead horror movie, which, given it's budget, is a pretty good movie. It's got its quirky moments, but it's dark and pretty grisly. You'd have to be a very unusual person to come away from that movie and think "light-hearted". Basket Case 2 contains some of the same characters and themes, but it's a fundamentally different movie. It's clear that Henenlotter was inspired Tod Browning's 1932 film Freaks. While the story still focuses on Duane and Belial, the movie immerses us into Granny Ruth's house and the bizarre creatures who live there. Belial still kills some people and Duane still acts weird, but the movie doesn't apologize for the fact that it wants to promote those who live with Ruth. The movie's focus lies in the way that Ruth treats all of those people as if there is nothing wrong with them, and much of this is played on a very light, humorous way. Henenlotter is purposely juxtaposing the grotesque nature of these characters with the casual, familiar way in which they interact with one another. And all of this is the reason why I've never been a fan of Basket Case 2. For one thing, the "freaks" are simply too freaky. While's it great that Henenlotter didn't usual actual people with abnormalities, Special Effects Make-up Artist Gabe Bartalos was given way too much creative freedom in allowing his imagination to run wild while designing these characters. In short, they are so weird, that they deviate completely from any sort of realism. Now, I realize that none of this was meant to be taken seriously, but it's gone so far into the realm of being cartoony that it pulls me out of the movie. Viewed out of context, the makeup shows a great deal of creativity, but it doesn't really work for this movie. I don't look to a movie like Basket Case 2 for realism, but the "freaks" are simply too freaky. That's not say that this isn't a Henenlotter film, and it's definitely the sequel to Basket Case. The movie doesn't have the same level of sleaze as the first film, but it certainly has a low budget look at times -- the sets all look like sets. And, as noted above, Belial does kill some people, but we don't get the same level of gore as the original. 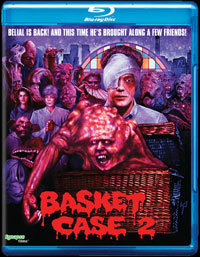 The question is, "Will fans of Basket Case like this sequel?". While it's similar, the tone is different, and may turn off those looking the same gritty z-grade experience that we got from the original. Basket Case 2 rocks some classic 80s women's fashions on Blu-ray Disc courtesy of Synapse Films. The film has been letterboxed at 1.78:1 and the Disc contains an AVC 1080p HD transfer which runs at an average of 30 Mbps. The image is sharp and clear. This transfer carries a very slight amount of grain, which is more noticeable in some shots than in others. A few very minor defects from the source material are visible at times. The thing which really stands out about this transfer are the colors. The movie doesn't shy away from bright colors and they look great here. The movie is somewhat flat, but the crispness of the image lends nice detail to certain shots. The Disc carries a DTS-HD Master Audio 2.0 track which runs at 48 kHz and a constant 1.6 Mps. The track provides clear dialogue and sound effects. We don't bet any dynamic effects here, but the dialogue is always audible and it's not drowned out by the music. There is a touch of problem with the range, as Belial's growls are louder than the other effects. The Basket Case 2 Blu-ray Disc contains two extra features. "The Man in the Moon Mask" (6 minutes) is an interview with David Emge, the actor who played "Half-Moon", where he discussed how he became involved in the film and his on-set experiences. "Beyond the Wicker" (23 minutes) is a featurette from 2007 which was made by and hosted by special effects make up artists Gabe Bartalos. Comprised mainly of home video from Bartalos' workshop and production stills, Bartalos provides commentary and talks about the production, obviously putting the most emphasis on the make up. This also includes a look at Bartalos work on Frankenhooker. We also get a conversation with Bartalos, Henenlotter and Producer Jim Glickenhaus.